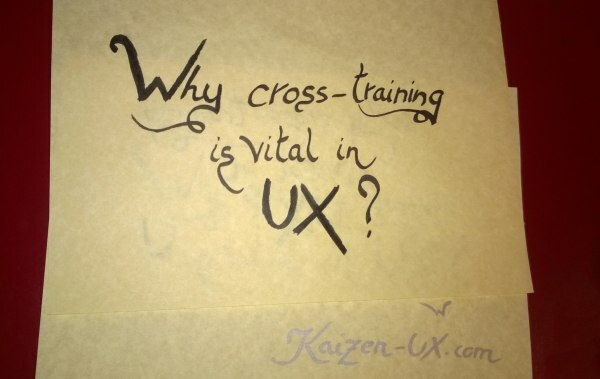 Why cross-training is vital in UX? Posted on 15-07-2014 by Peter W. Szabo & filed under UX Management. More on the benefits will follow soon, but first let me tell you a story. A few weeks ago I did user experience consulting for a company in the financial sector. The tasks was to improve the usability of their flagship software. As you might have guessed the desktop application featured quite a complicated drop down menu. After digging through the documentation and watching experts use the software I could find out what each menu option does… except one labelled “Squirrel test”. When clicked it did absolutely nothing. Not even an error message. I asked the finance experts who were tasked to help me with the project and they told me, that it’s “something that the developers put in to make support streamlined”. Then I asked the manager of the developer team. He told me “it must be some sort of basic financial test, because it is part of the software since ages”. I insisted on finding the answer, so we dug into the code. What it did was quite odd: when clicked the program tried to find transactions with the flag “squirrel”, but there was no such flag in the application (no small feat in case of an application with 23 different flags, grouped into five categories). It was the legacy of the programmer, who left the company three years ago, and the squirrel flag was basically a special “bug” flag, but he hated the word “bug”. You don’t need an external UX consultant to tell you that such thing should be eliminated, yet it survived at least three years. Unfortunately this was only the tip of the iceberg. While the given company had many very talented finance experts and skilled software developers, what they were missing is cross-training. What the hack is cross-training in UX? 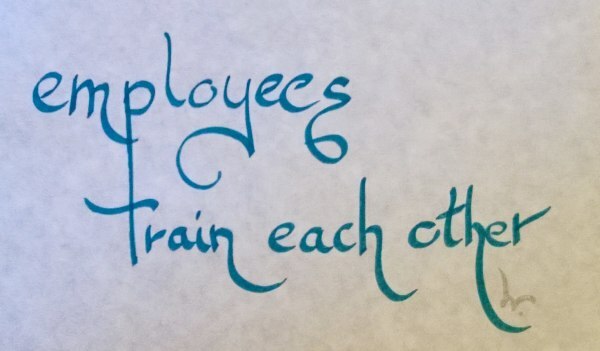 Cross-training employees means that they will learn skills and knowledge specific to other jobs within the same company. Initially managers used cross-training for the quite obvious reason of achieving higher flexibility of the workforce. Let’s say John is cross-trained to operate the heavy machine usually operated by Daenerys. In case of Daenerys needing a few days off, John can jump in and the said machine will not have to stop and the production can continue. While UX experts rarely operate heavy machinery, we benefit a lot from cross-training, because they are in dire need of a broader understanding of the organization and its products, moreover in case of larger UX team, the team will benefit from the flexibility of its members. In the recent years UX jobs split into different roles. Nowadays we have UX designers, UX consultants, UX researchers, UX strategist, etc. Then when there are a handful of UX jobs at a company this usually calls for a UX manager, and then there is need for an officer responsible for the overall user experience (UX) of an organization, so the job of chief experience officer (CXO) was born. Moreover different UX experts (even if they have the same job title) might have radically different skillsets. Fortunately it is quite easy to organize cross-training within the same team, and usually it is quite effective. If the team leader or UX manager believes in cross-training this can and will happen painlessly and the whole organization will benefit, not only the UX team. A few years ago cross-training in search engine optimization was a top priority for me. That is because back then quite a few things I did for the users was overwritten by SEO gurus. Fortunately SEO became very user centred, but it still makes sense to cross-train into SEO. Obviously visual design and user experience design walk hand-in-hand, and quite a few great UX designers where visual designers a few years ago. Not to mention front-end development. If you manage to cross-train one or two UX designers from your UX team into front-end developers you have a quick win there. The support team is also a great candidate where you should cross-train, because most user experience issues surface there. But then again there is no team where you should avoid cross-training UX experts. Obviously visual design is a lot better candidate to cross-training than IT security, but a UX expert wearing the ITsec hat could do wonders (mostly because it is such a rare sight). Aside the obvious benefit of being able to fill multiple roles if need be, the most important benefit is the broader understanding of the organization and the increased flexibility of the employees. Horizontal expansion of the job is always beneficial. Let’s say for example, that Robert does wireframing and rapid prototyping in your UX team. If you make the Information Architect teach him about IA he will be able to understand more about it and create a lot better wireframes and prototypes based on the IA knowledge, and it will be a lot easier for the Information Architect to communicate with him, and make him understand what to do. This can also lead to job enrichment as in vertical expansion, because you can now task Robert to do things beyond the call of the job, and eventually advance him into a more senior role. Learning new things and putting them into practice is a good way to overcome boredom. While UX jobs are rarely boring (in my experience they never are, but then again I’m in love with UX), but they can became boring, if the same task is repeated over and over through years or decades. 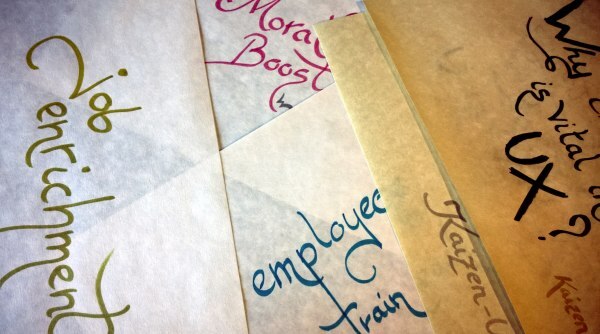 Cross-training broadens the perspectives and the job opportunities of the given employee. While this might be a horrific thought for a manager, new job opportunities can be within the company, and even if not, the thought of being special and well educated always leads to high morale. So cross-training is a cheap way to boost morale. Cross-training often leads to the development of deep bonds between team members when they teach each other. While this does not replace team building events it can and will increase morale. There is one more morale increasing aspect of the cross-training, and that is when the learning and knowledge is shared down on the chain of command by senior members or managers, because that puts a higher (and better paying, more reputable) position within the grasp of the employee. Not to mention it helps combat the disconnected nature of management in case of some UX teams. The cheapest and most effective cross-training is when members of the same organization train each other, but any kind of cross-training is highly valuable, and this is unlikely to change until we can download knowledge and skills directly into our brain. I hope that cross-training will be a basic practice of each and every UX manager. Even if you are not a manager, you can initiate cross-training, and taking the initiative is always considered as a positive sign in UX.